"The French police wouldn't give me no peace," British poet Rod Stewart sang in his classic ode to fancy-freedom "Every Picture Tells a Story." 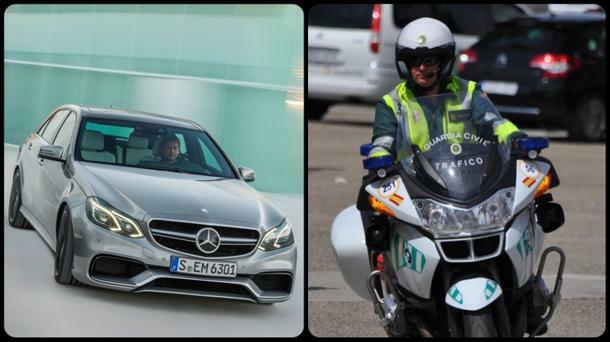 But for a cadre of American auto journalists on a Mercedes-Benz E-Class AMG media drive Thursday, the police problem was Spanish. After a lovely day bombing over the picturesque twisties and sweeping bends of the Catalonian countryside under and over the sawtooth protrusions of Montserrat, and just before arrival at their refined golf course-adjacent lunch destination, about a dozen and a half writers from major and minor automotive and lifestyle publications were detained by local police. The reason given by the guarda civil trafico? Failure by any of the assembled media to produce an International Driver's License. Though the flimsy card requires no test, attests solely to the owners possession of a valid American driver's license, and is not required to drive legally in Spain, the journalists were held on the side of the road, and then in a pen-like local parking lot, for nearly two hours. Worse than this, six $100,000 Mercedes-Benz E63 AMG sedans and wagons were impounded indefinitely and the blameless journalists involved were banned from further participation in the afternoon driving of the 550-hp cars. After some useless wrangling by the journos in the international language of Desperanto, a local "fixer" in a sharkskin suit, as well as a trio of Mercedes representatives, were dispatched to attempt to rectify the situation and guarantee the release of the journalists — and the gloriously overpowered vehicles. Sadly, they were able only to achieve the writers' freedom. "No fines were paid, no charges were brought, and no bribes were given," said Mercedes spokesman Christian Bokich.